Flowering habit at Kula Ace Hardware and Nursery, Maui, Hawaii (USA). September 06, 2007. Habitat: Guzmania lingulata grows mainly in rain forests and cloud forest, especially in moist ravines where at least for part of the year, moisture is delivered solely as mist. Usually it grows rather close to the ground on small trees or branches. This species flowers mainly (but not exclusively) in the early rain season and the fruit mature from the latter rainy season and through the dry season. It is common to locally abundant. Guzmania lingulata var. concolor Proctor & Cedeño-Mald. Guzmania minor var. flammea L.B.Sm. 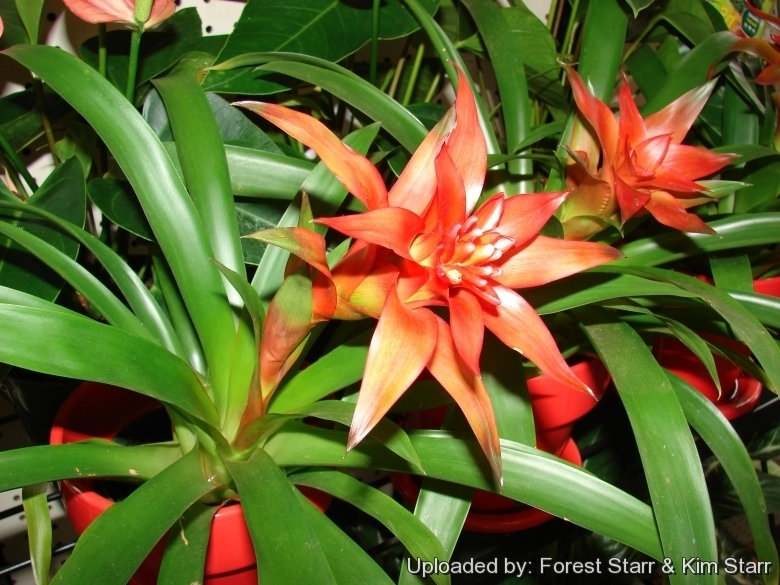 Description: Guzmania lingulata (a.k.a. Scarlet Star ) is a glabrous spineless epiphyte bromeliad (that grows upon another plant for support). Scarlet Star is one of the most commonly cultivated bromeliad types with very showy brilliant red, pink or yellow spikes. Roots: Small that serve for attachment only to a tree or moist rock..
Leaves: Thin and flexible, 20-35 cm long and 1-4 cm wide, green with a glossy sheen, ascending then spreading; sheaths ovate, brown lepidote; blade ligulate (strap-like), acute or acuminate, caudate at apex, the inner leaves held well above the scape. Inflorescence: Simple, solitary, flat topped, cup-shaped, few flowered, 15-25 cm long, hold on a stout upright scape in the centre of the rosette and long-lasting. The outer scape bracts (modified leaves) leaf-like, the inner ones orange red, grading to red-orange tipped with yellow-orange, the innermost ones yellow-orange tipped with white, all becoming green in fruit. Floral bracts white tinged in yellow, about 4,5 cm long, a little longer than flower. Flowers are tiny, yellow tipped with white, almost hidden among the bracts and attracting hummingbirds; sepals slender, white linear, fused for most of their length, about 3,5 cm long. Pollen white, sticky in large clusters. The flowers fade but the showy stalk's bracts remain for weeks if not months later. Plants bloom once and then fade over a period of three years. Blooming season: Usually in cultivation it flowers in the spring and summer's warmth months. A rosette usually reaches the flowering size in three to four years. Fruits: Capsules, usually 3-sided, about 3 cm long and 5 mm wide, brown, acute at apex, the the valves splitting open at maturity and with numerous seeds. Remarks: Across its range it is quite variable, as some plant have variegated foliage and others have pink bracts. It has been used for breeding and is a primary parent for many of the variously coloured guzmanias widely used in interior scapes and tropical shade gardens. Cultivars produce blooms in a variety of colours, such as bright yellow, orange, mauve, and lavender. Guzmania lingulata var. cardinalis (André) Mez: is found only in Bolivia's and Ecuador's montane rainforests and has bright red bracts. Guzmania lingulata var. minor (Mez) L.B.Sm. & Pittendr. : is smaller growing and with fewer bracts on the flower stalks. 1) Wikipedia contributors. "Guzmania lingulata." Wikipedia, The Free Encyclopedia. Wikipedia, The Free Encyclopedia, 21 Aug. 2014. Web. 16 Sep. 2014. 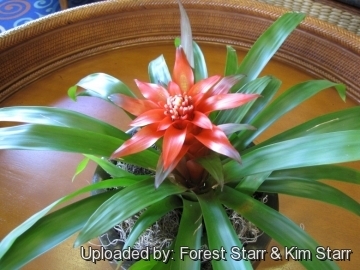 2) Forest & Kim Starr Guzmania lingulata (Scarlet star, orange star). Plants of Hawaii. <http://www.starrenvironmental.com>. Downloaded on 16 Sep. 2014. 4) CONABIO. “Catálogo taxonómico de especies de México.” 1. In Capital Nat. México. CONABIO, Mexico City. 2009. 5) Davidse, G., M. Sousa Sánchez & A.O. Chater. “Alismataceae a Cyperaceae.” In G. Davidse, M. Sousa Sánchez & A.O. Chater (eds.) Fl. Mesoamer.. Universidad Nacional Autónoma de México, México, D. F.1994. 6) Foster, R. C. “A catalogue of the ferns and flowering plants of Bolivia.” Contr. Gray Herb. 1958. 7) Gilmartin, A. J. “The Bromeliaceae of Ecuador.” Phanerog. Monogr. 4: 1–255.1972. Cultivation and Propagation: As Guzmania lingulata is native to rainforests, cool evening temperatures with warm days and high humidity describes its best growing conditions, however it grows very well as a home plant too. Individual plants live three to four years. Exposition: Grow guzmania in bright filtered light both indoors and out. In the garden it prefers partially shaded areas and grow best where they'll get morning sun, or shifting shade throughout the day. It adapts very well to deep shade and dim interior rooms, surviving well on fluorescent lighting alone. Low light often intensifies the bract colours that develop.